Final preparations were underway Friday to launch the space shuttle Atlantis on the last mission of its 25-year career, taking astronauts to the International Space Station (ISS). The 32nd and final voyage for Atlantis, first launched in 1985, will take six astronauts to the orbiting space research facility, delivering an integrated cargo carrier and a Russian-built mini research module. Lift-off is scheduled for 2:20 pm (1820 GMT) from the Kennedy Space Center near Cape Canaveral in Florida, weather permitting. "We've had a very clean countdown so far and we're currently on schedule," NASA test director Jeremy Graeber said Thursday. "We're not working on any issues. Space officials said their primary weather concern is a low cloud ceiling. But the forecast is good overall, calling for a 70 percent chance of favorable conditions at launch time. 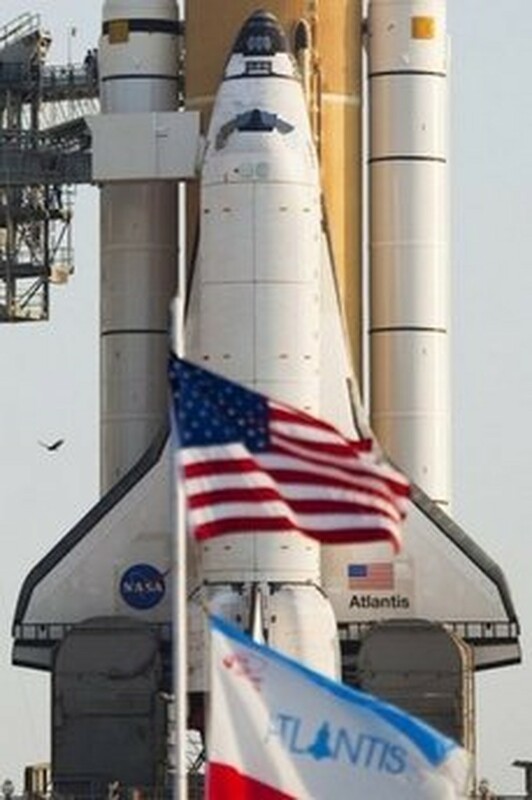 Space Shuttle Atlantis is seen on a Kennedy Space Center launch pad. Final preparations are under way to launch the space shuttle Atlantis on the last mission of its 25-year career, taking astronauts to the International Space Station (ISS). In a poignant moment for NASA as the US space agency counts down towards the end of an era in human spaceflight, Atlantis will be retired on its safe return home. "The vehicle is in great shape... and from a space shuttle program and ISS program standpoint, we're ready to launch Atlantis and get this mission under way," NASA launch manager Mike Moses said this week. During a 12-day mission largely spent moored to the ISS, Atlantis and the crew will deliver over 12 tonnes of equipment, including power storage batteries, a communications antenna and a radiator. The biggest single element being transported is the five-tonne Rassver research module, or MRM-1, which will provide additional storage space and a new docking port for Russian Soyuz and Progress spacecraft. The Rassver -- dawn in Russian -- which will be permanently attached to the bottom of the space station's Zarya module, carries important hardware on its exterior including a radiator, airlock and a European robotic arm. Three spacewalks, each lasting six and a half hours, are planned during the mission, notably to install new batteries and a communications antenna on the space station. When the mission is complete, only two more shuttle launches remain -- one each for Discovery and Endeavour -- before the aging fleet is mothballed at the end of the year. Once the three shuttles are retired, the United States will rely on Russia's three-seater Soyuz spacecraft to take astronauts to the station until a new fleet of commercial space taxis is operational.